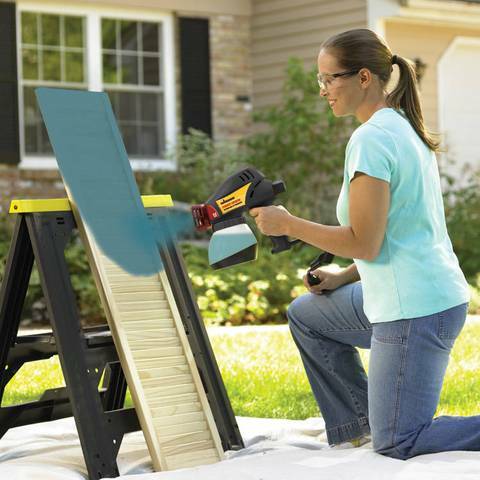 The 0525010 Wagner project sprayer with dual-tip technology is a detail painter for small refinishing projects around the home such as chairs, lattice, fences and outdoor playsets. The 4.8 GPH electric paint sprayer can spray thin to thick liquids, including latex, making projects a breeze. The optimus dual-tip technology offers more control and even coverage for a professional look. The Wanger paint sprayer has lubricating oil that protects the sprayer between projects. The 0525010 Wagner project sprayer with dual-tip technology features a 1-quart cup, spare atomizer valve and cleaning brush.